Despite the clever physics, Gravity doesn't offer enough fun to keep the ball rolling. We're not sure how Professor Heinz Wolff got involved with Deep Silver, but apparently someone thought it was a match made in heaven. His name appears on the front of the company's latest DS puzzle game, Gravity. Although it has a few clever ideas, none of them kept us entertained. Gravity features a simple concept. You have a pre-set number of puzzle pieces and must somehow jar one of them into the button. You need to align these pieces in certain formations, dragging them wherever you see fit. (There's a pop-up window showing you which ones are available.) Along with your available pieces, the designers scattered objects throughout each stage, including ramps and walls. When you've got your pieces stacked in place, a ball comes rolling down, slamming into your formation. The force from this collision sends the pieces flying and, in theory, one of the pieces will hit the button. The way Deep Silver uses realistic physics in Gravity piqued our interests, but not for long. Brainiacs may get a kick out of setting pieces in place and figuring out the right solutions, but most of the levels are easy to exploit. You can get away with setting up a quickie formation to hit the button the wrong way, rather than logically thinking things through. It'll take you a while to complete the game's 100 stages, but once you do, there's little reason to play. 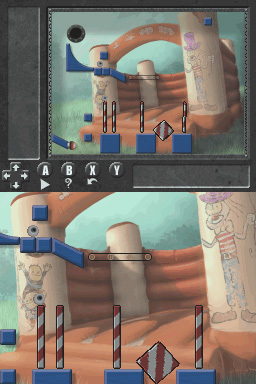 No additional stages are available, neither through download or hidden within the game. There are other modes, including a Sandbox mode without time limits or restrictions and two cannon-shooting mini-games, but after playing through them a few times, you'll probably grow bored. There isn't much to the presentation, either. Aside from a few creative level designs, all you've got to look forward to in Gravity are a few drab backgrounds and objects with very little animation. At least the music isn't bad. There are a few soothing compositions that match up with the worldly themes. It's nothing we'd run out and buy the soundtrack for, however. With downloadable levels, additional stages and balanced gameplay, Gravity could've really been something special. Instead, this is a puzzle game best left on the shelf. What's Hot: Some cleverly designed puzzles, realistic physics, the world-theme music is very easy on the ears. What's Not: Disappointing gameplay, it's too easy to cheat on certain puzzles, unimpressive graphics, worthless mini-games.